This week was mostly eaten up by holiday baking and finishing up my last bits of Christmas shopping. I’m relieved to be finished (although I’m still waiting on one ordered item and a replacement for a book that arrived from Amazon with a creased cover). Still, I’m done! I’m DONE. I might, if I feel like it this week, hit the pet store to get some cat treats or something for the cat, but honestly I’ve even worked hard to plan meals for the week and do grocery shopping so I should barely need to leave the house at all unless I want to between now and Christmas. Which is good, because this week is going to be filled with candy-making and even more baking. I had intended to read a lot more this week, while waiting for oven timers to go off and stuff, but after racing through Tansy Rayner Roberts’ excellent new novella, Girl Reporter (out 12/19 from The Book Smugglers: pre-order here), I’ve been moving a little more slowly through Ada Palmer’s newest Terra Ignota novel, The Will to Battle (also out 12/19, from Tor). 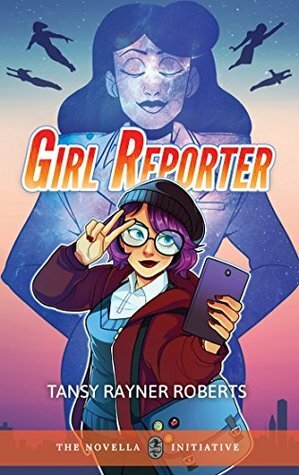 Girl Reporter is a delight, cover-to-cover, and the perfect way for the Book Smugglers to end their first year of novella-publishing. I’ve loved Ada Palmer’s series since the beginning, but I have to admit it’s a very dense, heavy read for this time of year, so I’m only about a quarter of the way through. I’m hoping to finish it and have a review out by Tuesday, but we’ll see. Also, I got to see The Last Jedi yesterday. It was everything I wanted it to be. I didn’t cry nearly as much as I expected, but I am nevertheless full of feelings about it. I’ve got enough to do this week already that I’m not going to commit to writing about this movie, but if I do, expect ALL the feels and ALL the spoilers. Also, porgs are great. Don’t @ me. I really enjoyed Jeannette Ng’s Under the Pendulum Sun when I read it a few weeks ago. This week she was on The Skiffy and Fanty Show to talk about the book. The Barnes & Noble Sci-Fi and Fantasy Blog has the cover reveal for European Travel for the Monstrous Gentlewoman, the sequel to Theodora Goss’s excellent 2017 novel, The Strange Case of the Alchemist’s Daughter. There’s a new story by A. Merc Rustad at Lightspeed: “The House at the End of the Lane is Dreaming”–plus an Author Spotlight. I highly recommend “Maiden, Mother, Crone” by Ann Leckie and Rachel Swirsky on this week’s Podcastle. And “Haunted” by Sarah Gailey at Pseudopod. I read this story last year in Up and Coming, and found it really memorable. You can read the text of “Haunted” over at Fireside Fiction. Uncanny Magazine has posted the guidelines for submissions to their special dinosaur-themed issue. Electric Literature has a list of 9 Essayists of Color You Should Know About. There were a couple of new-to-me names on here. There’s going to be a new She-Ra: Princess of Power on Netflix! I’m so excited about Annihilation. And thrilled that Gina Rodriguez is in it!